I believe it was one of your team members who found us this cabin. As I recall, Millstone Lodge wasn't listed on AirBNB or VRBO, but we found your site or some other site and called about general availability. I forget with whom I spoke, but she was very friendly, professional and vested in finding the right cabin for us. The staff was very helpful and patient and answered any question we had! I was also very pleased with the phone call we recieved as soon as we checked in to make sure we made it there safely. What a wonderful Christmas vacation this has been. We set out with a million activities to do in our minds but at the end of the day, I couldn't wait to get back to comfy cozy feel of this cabin and the people in it. With hopes of a white Christmas that didn't happen, the cold fresh mountain air is what we really needed. Thank you very much for an amazing view that added in a Christmas scene of perfection. Can't wait to plan our next trip. What a memorable stay. Beautiful views and wonderful memories made. I hope that we will have the opportunity to return and re-live the experience all over again!. Everything was perfect. We spent Christmas here in Bryson City this year and couldn't have asked for a better vacation!. We came up from Florida to visit the EBCI. Big Oaks Pointe had everything that we needed and more! We will be back soon. Everyone was super nice and accommodating. Wonderful experience! It has been a wonderful stay in the "Walk in The Clouds Cabin" The cabin is very comfortable and it has everything we needed to be honest I was impressed by the location and the views from this altitude. We hope to come back soon. We enjoyed our stay at your beautiful cabin. Had a great Christmas break, wouldn't have spent it any other way. The cabin was very clean and the beds very comfortable. WE came to the Great Smoky Mountains for a peace filled celebration of the Saviors birth. First time with out the kids since they are all grown now. 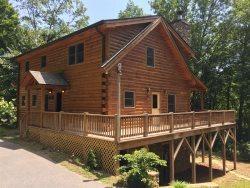 The cabin is an excellent place to retreat. Spent the week hiking Deep Creek Waterfalls, Alum Cove and Goldmine. We were surprised how close the national park is to Bryson City. It surrounded the cabin. My wife and I had the pleasure of staying her over Christmas with our two Dobie's. We spent most of our time gazing out this window, studying the trees in varying shades of light and fog as clouds rolled over the mountain ridge. Having spent so much time inspecting these hill, I was shocked to find our first clear night a lighted radio tower at the top of the nearest ridge. I couldn't believe that we had missed it. I couldn't believe that we hadn't noticed it before. Three steady white lights in a vertical line, an hour later we realized that it had moved and was Orion's Belt. A wonderful place to stay with family. This is a nice place to stay for the Christmas time with friends. We have really enjoyed it. I thank you for allowing us the opportunity to enjoy the mountains. It looks like we were the second guests to stay in "A Walk In The Clouds" and a great experience just as the first guests. The views and the cabin were spectacular and can't wait to come back again. During our stay we hiked to Deep Creek waterfall trails in Bryson, had lunch at The Filling Station which was excellent. We also visited Cherokee, NC and the great gift shops there. We saw several Elk and hiked many other trails. Thank you for the use of your beautiful home. The beds were comfortable, all of the amenities were perfect and we enjoyed our stay. We will be back. Very cozy and clean. Cozy fireplace and great kitchen. Kathy whom I spoke with on both of my stays was very friendly and helpful.